Tannins are fairly bitter, so a process which can remove them should result in a less bitter beverage. Reduction in tannin content should also lighten the overall color of the vodka. We’ll be following Arnold’s procedure for making boozewashed tea vodka, which will then be used for his Tea Time cocktail. Both are covered in Liquid Intelligence and on the Gastropod website, linked above. We had slightly less tea than we needed, and we’ll only be washing half of the tea vodka, so the materials list has been scaled accordingly. Additional procedure is available via Liquid Intelligence or the Gastropod. Strain tea from vodka and divide liquid in half, setting one half aside. 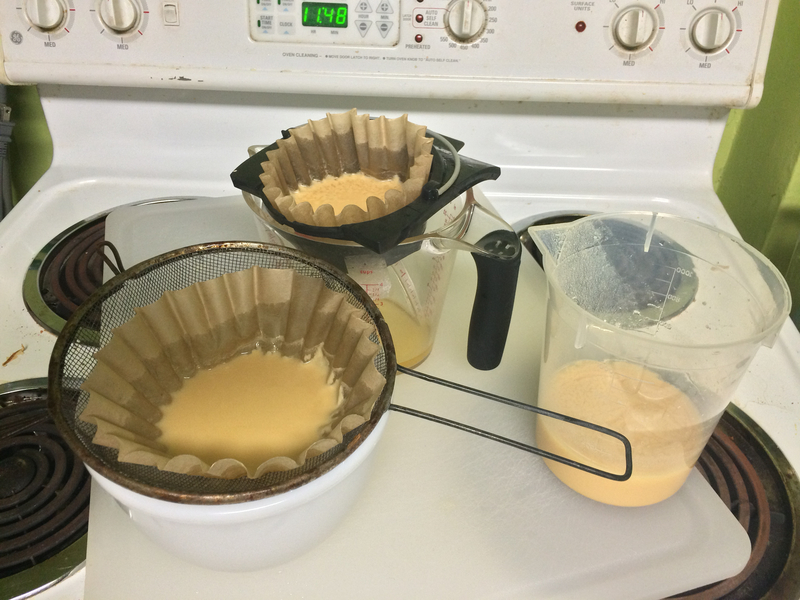 The kitchen scale can be used for dividing the liquid, if desired. Place milk in a container and stir in half of the vodka mixture. Allow this to set for a few minutes, which is an excellent time to juice a lemon. During the down time, juice lemons for cocktails and combine honey and water in a container to make the honey syrup. 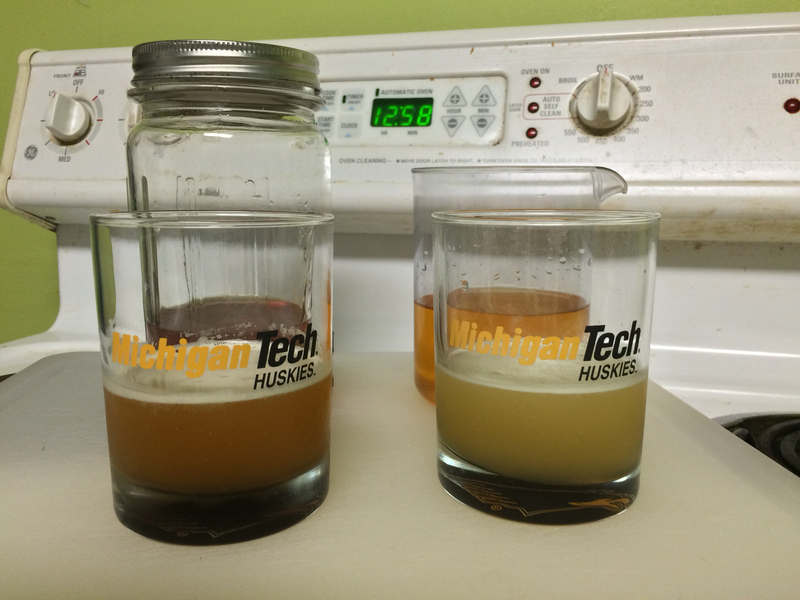 We added both honey and water to a mason jar, which was then shaken to mix them. Curbs, tannins, and other undesirables which have settled out of the vodka. Exploiting parallelism to filter more vodka faster. The initial pass through a wine filter re-suspended the smaller particulates. Sample vodkas neat / on the rocks (optional). Combine unwashed vodka and other ingredients for cocktail in shaker, shake and serve. Repeat with washed vodka. Sample, for science. 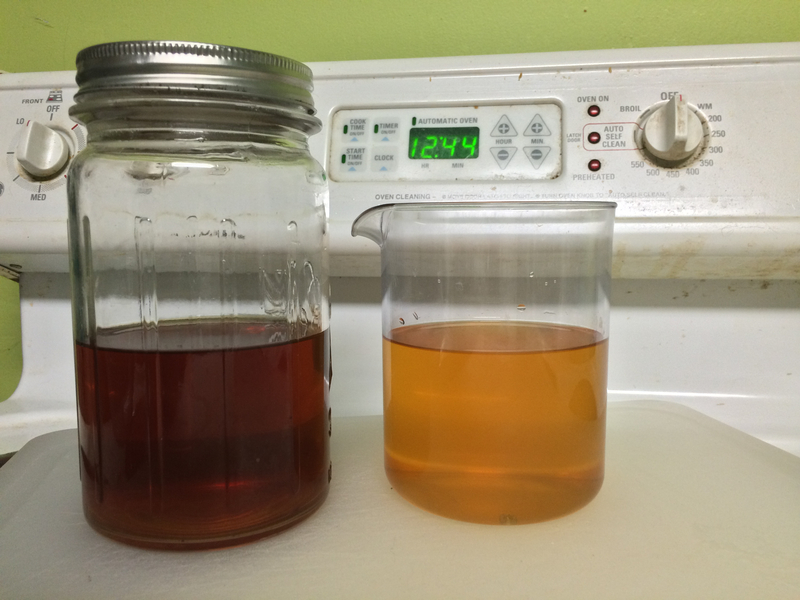 As seen in the below photo, the unwashed tea vodka (left) is considerably darker than the washed version. The unwashed tea resembles a traditional black tea — which is unsurprising for Darjeeling — while the washed tea is closer to a strong green tea. Unwashed (left) versus boozewashed (right) vodka. Note the distinct color difference. Sampled neat, the vodkas are distinctly different. The unwashed vodka has a distinct tea flavor which is strong to the point of being over-extracted. It is tannin-y and bitter, the sort of tea that was left sitting a bit too long. The washed tea vodka retains some of its tannin sharpness, but is much more pleasant to drink. Washing the vodka removed most of its bitterness, and left a beverage much closer in character to a green tea than the black tea it started out. We did not notice a change to mouth-feel, though it may have been hidden by the strong flavors involved. The properties we observed in sampling the teas neat carried over to the cocktails, color included (see below). The unwashed vodka carries a strong, bitter tea flavor into the finished product, while the washed tea is less harsh and generally better balanced. Both are better cold, as their bitter notes become more prevalent as they warm up. Tasty, tasty cocktail. And a tannin-y, unbalanced mess. 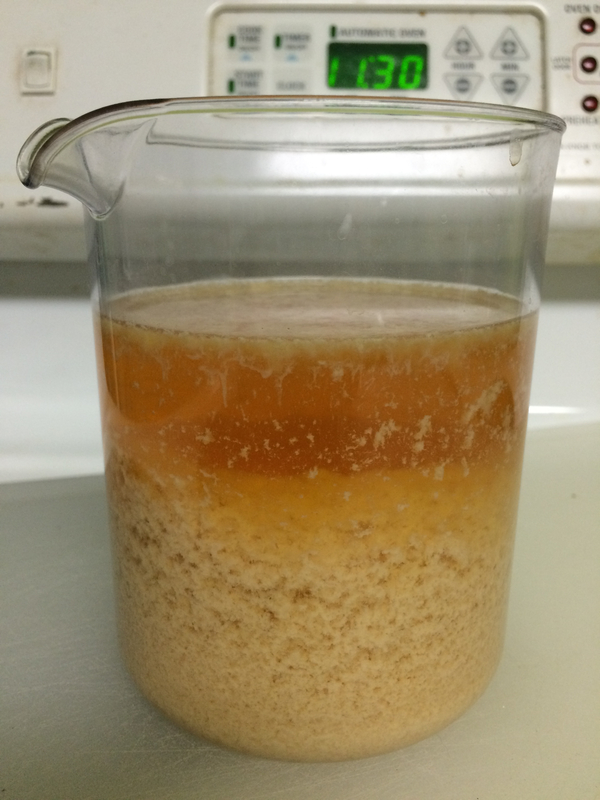 Honey syrup foams when shaken, and holds that foam for quite a while after it is allowed to sit. This carries over to cocktails made with it, though to a lesser extent. We forgot the salt in the initial cocktails. Remembering to add it on a subsequent tasting produced a notably better beverage. As with most long-running steps in food preparation, boozewashing does seem to be worth the time in this case. It produces a beverage which is noticeably less harsh, and more drinkable, than can be had without the extra effort. Arnold mentions that this same technique can be applied when infusing other flavors — like coffee. In addition to boozewashing coffee-infused liquor, it could be interesting to try washing normal, brewed coffee. It may also be interesting to try washing bourbon or wine, though finding bourbon or wine we’re willing to wash, and willing to drink neat, may prove tricky.